The Roland CAMM-1 Servo GX-24 uses a digital servomotor to achieve maximum accuracy and cutting speeds up to 20in. per second. The precise cutting at high speeds is a direct result of a built-in curve smoothing function. This is where other vinyl cutters/plotters don’t measure up. Blade offset values can also be adjusted manually for optimum results on a wide range of materials. An optional small-lettering blade produces sharp, hi-quality results for small and intricate designs. The result is faster production and graphics so crisp; they resemble those of a professional. 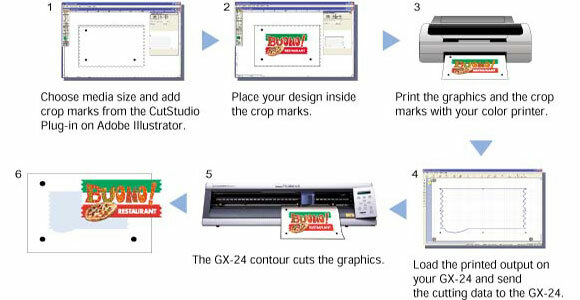 Roland GX-24 vinyl cutter/plotter wins over even vinyl cutting rookies in seconds. Simply connect the Roland GX-24 through the USB interface to your computer, pan through features and functions on the easy-to-read LCD screen, and use the included Roland Cut Studio software to create incredible graphics for banners, vehicles, store displays, signs, backlit displays, and much more. The Roland GX-24 control panel even has a blade groove on its apron for easy manual cutting. There’s even a sheet roller base included with every GX-24 vinyl cutter/plotter to keep media feed straight. The Roland GX-24 vinyl cutter/plotter is the perfect solution for the novice engraver.